Tai Hustle is an artist that I interviewed a few years ago and is still very focused and concentrated on mastering MC’ing and really understanding the business aspect of hip hop. I see this guy going places and that is why I revisited with him to see what he has been up to since our last talk. A determined mind like this is something that I can relate to and I see him definitely elevating in hip hop. 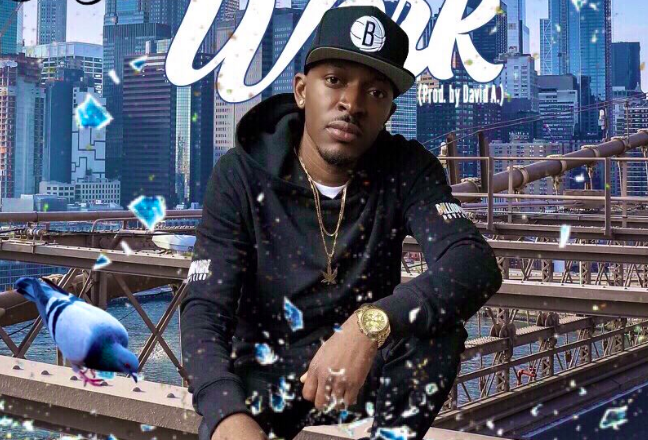 Check out what Tai has been up to and enjoy some of his new music, that new single Work is serious. Check out and purchase the new single Work HERE. You can also check out all of his music on iTunes HERE. MusicalFury – Good afternoon, how have you been? Tai Hustle – I’ve been good. Hustling and steadily growing with the music. MusicalFury – What have you been up to since our last interview? That must have been at least a few years ago. Tai Hustle – Yes, that was a few years ago and thank you. I’ve been busy working hard within the music and directing my energy in the right direction. A few years ago I understood the game as, if you’re a dope rapper then the opportunities should come but that’s so far from the truth. I had my project, “God of Brooklyn” out at the time which I considered a Classic Hip Hop/Rap album and it was well received but it’s a ton of other rappers with dope music that you will never hear. I realized that I had to be more than just dope but I had to understand the business of music and how to make it work for me, in the same way I understood the streets and hustling. I began to figure out how to create a demanded product and found that comes with not only creating great music but a great social media presence, industry connects with the right people and knowing how to build, grow and manage yourself as a artist and a brand. So, I took some time in between dropping singles here and there to actually learn the business. I had meetings with other industry heads to just be mentored, worked with different artist/talent and went to school taking nights, weekends and online classes and now about to graduate in a few days with a Bachelors degree in Business Management and Economics with a concentration in the Music Industry. See, the goal is not to just be a great rapper but to one day be a mogul and run my own empire. MusicalFury – I really like to hear that, you have been doing some really positive and productive things. You had some really well received mixtapes over the past few years and have been steadily making music. What inspires and motivates you to create music? Tai Hustle – I want better for myself and my family. I love my family and I love Hip Hop and so the goal has always been to take care of my family doing what I love. It’s all about love. When you move from a place of love, no move you ever make is wrong and so you can say that my motivation is love. MusicalFury – You are Jamaican born but spent most of your life in Brooklyn, right? Does your music get influenced in any way by Reggae? Tai Hustle – Yes, I am Jamaican born and spent most of my time growing up in Brooklyn. My music is influenced by reggae but I’m a Hip Hop/Rap Artist so I generally focus on the Rap side of things but lately I’ve been taking more chances musically like writing a country record, doing an EDM remix with a German producer or jumping on R&B/Pop songs. I’ll be putting out a Hip Hop/Reggae single called, “Get Off”. I already uploaded the ruff draft to SoundCloud to kinda gauge how the fans will receive it and based off that, I think it’s a go. So look out for “Get Off” to hit iTunes, Spotify and everywhere in the coming months. MusicalFury – What artist would you like to collaborate with on a song that you may try to make happen in the near future? Tai Hustle – I honestly am not thinking of a specific artist that I want to work with. I’m open to working with dope people, doesn’t matter if your a A-lister or just some guy starting out, as long as you’re dope. I’m from a place where most people were farmers, living of the land and basically hustling to survive day to day without much. A descendant of the maroons of Jamaican and so my beginnings wasn’t easy and because of this I enjoy giving as much opportunity as I get. I just want to do well and see people do well. It’s room for us to all win! MusicalFury – Tell me a little about Swag’d Out Records, is that your label? I noticed that you have your solo tracks up on iTunes under this label. MusicalFury – Do you still consider yourself the King of Brooklyn? Tai Hustle – Hustlas (I call my fans Hustlas) and some industry folks still seriously/jokingly refer to me as “King Of Brooklyn” but I don’t really push that narrative anymore. I had a long talk with DJ Kay Slay and he made some great points, that while I may not be worried about what Maino will do as far as me dissing him on my song “King Of Brooklyn”, that I didn’t want certain negative things surrounding my career. He pointed out the Maino and Papoose beef. He said that people saw the street side of things but behind the scenes that beef situation cost him contracts, lost hundreds of thousands of dollars and certain relationships which was not worth it at all. In the end, I agreed that he was right and so he spoke to both Maino and myself and squashed that beef. I don’t have beef with Maino and as far as King Of Brooklyn, the fans, the music and time will decide. MusicalFury – That is excellent, I feel that you are in a very positive and focused mind frame and Maino also seems to be very positive and focused as well. You took a little time off between your last mixtape God of Brooklyn and your new EP titled BrownsVille. Any particular reason or are you just trying to get the business right? Tai Hustle – Yes man, just getting the business right. When we first spoke I wasn’t making any money from music, now I do. I’m independent but having success within my own situation. Sure, I’ve gotten some interest from Columbia Records and UK label Red Light Records and someday may sign to a label but until I actually put my name on those dotted lines, I gotta keep pushing for all my dreams. No one is going to make it happen for you, you have to get up, get out and get it on your own the Hustla way. MusicalFury – What is your main goal with hip hop right now? Are you looking to release a full-length album? MusicalFury – Based on some of the things you post you seem to have a spiritual side. Do you have specific beliefs about God? Tai Hustle – Yes. All glory be to God. MusicalFury – Amen brother. Thank you for your time and keep me posted on new music.